Dancing In a Jar is a quiet, gentle epistolary novel. A refreshing look at a time gone by, in a place where the author grew up, and a community that knew how to live in the present and make the most out of life. 1)You will not be surprised to hear that my favourite part about this book is the history. The earthquake of 1929, the Great Depression, the fishery and mining industries, the influence of the church on the community, politics (Newfoundland was not a part of Canada yet), the stereotypes and beliefs about Newfoundland from outsiders, gender roles, the language and dialect of the region, and the past-times (radio, parties, cards, music and dancing, book clubs, knitting groups). 2)The portrayal of the community. Through the letters of Don and Urla back and forth to their family in the US, we see glimpses of some of the other people in the community, and how everyone works together to carve out a life in an isolated cove. Generous neighbours, frequent gatherings for parties or for listening to radio programs, taking care of each other’s children. One of the ways in which the people there got through the Depression was by smuggling goods out of St. Pierre and Miquelon. When they knew the authorities were coming to inspect their houses for evidence of the smuggling, everyone started stuffing their ‘treasures’ into the snow banks. When I first arrived, I was concerned no one seemed to be thinking about the future as we seem to obsess about. But I think here, not focussing on what the future may bring enhances your chance of survival and certainly your capacity for happiness. In truth, I am ashamed of my apprehensions when we first arrived in St. Lawrence. How could my view of isolation be so distorted? How could I not have known that you can be poor and rich at the same time? 4)The love story. Not your typical love story; only by reading between the lines of their letters do we see their devotion to each other, and their devotion to the Newfoundland landscape and their new home. 5)It’s based on a true story. Don and Urla were real people who wrote letters about a real place and real people. The author used the letters that existed to create their story by filling in the gaps. We know from the beginning of the book that Urla is Don’s first wife. We also know that they had a baby named Barbara during their short marriage. So, we are also shown, through the letters, the tragedy that strikes the young couple. It’s sad, but gentle. 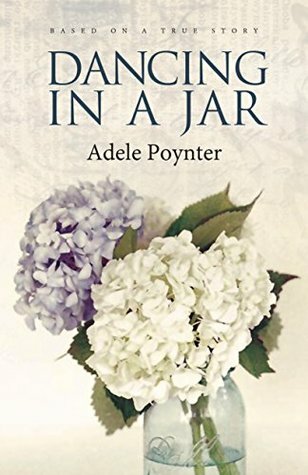 And we are reminded that Don goes on to marry again; a lovely woman who shares all of Urla’s best traits, and who gives life to Adele Poynter so she can tell us this story. Mom, you would be thrilled to learn he is an ideal husband. Just as you counseled, I left his socks exactly where he dropped them for two days and he got the message and has been more attentive ever since — well-considered advice! For another (more coherent) review of Dancing In a Jar visit The Miramichi Reader. *Thanks to Breakwater Books for providing me with a copy of the book for review! This sounds so nice, comforting even. Your review really evokes that sense of community. Comforting is a good word for it! What a wonderful quote to end on! Presumably it was work that took them to Newfoundland. Yes. Don went over to help start up the fluorspar mine in the area. Which brought in the issues of mining conditions and unions in the 1930s. A worldwide concern at the time. Both my grandfathers were miners. I love epistolary novels! I’d never heard of this one — thanks for bringing it to my attention. It’s new and it’s a debut, and it’s from a small publisher. The best kind of book to write about! This sounds lovely, Naomi. I hadn’t heard of it before. Lovely review! I think I would enjoy this. Thanks! Epistolary novels are nice to read every once in a while, I think. I find epistolary novels fascinating. Great review! “A quiet, gentle epistolary novel” – sounds like my kind of read. Fascinating to hear that it’s based on a true story – I guess it must add an extra layer of poignancy to the narrative. Lovely review, Naomi. Thanks, Jacqui! I personally love the fact that it’s based on a true story. It always makes me want to know more about the people, including all the secondary characters. You could even notice a difference between the 2 sets of parents (Don’s and Urla’s), which I thought was interesting. I love books based on true stories, and this was no exception. It must have been a true ‘labour of love’ for the author! I’m reading a quiet epistolary novel, too, at the moment, and it is so comforting, even though bad things will happen there as well. Did you find yourself wishing people today would write more letters? That’s how I feel. You are going to turn me into quite a CanLit wannabe reader because now I have to add this one to my wish list, too. Comforting is the perfect way to describe epistolary novels (at least the ones I’ve read). I always feel like I’ve gone back in time to the days of snail mail. And, yes, it makes me wish we all still wrote letters. I also think historians someday are going to be missing out on a significant way to learn about the past. Now I’m curious to know what you’re reading…. I don’t remember seeing it on GR, but I haven’t been on it much the last few days. The book is Letters from Skye, and the letters are going from the US to a little island in Scotland. It’s the perfect book to read at bedtime. You can say so much more in a letter than in a tweet. 😉 Which reminds me… I was happy to see you on Twitter now. I feel like the cover doesn’t really reflect the story, so I’m glad to hear that you like it! Now I will have to go check out Ella Minnow Pea – great title! You really love your historical fiction, don’t you? What a beautiful, glowing review. I love tender and gentle stories so I’ll keep an eye out for this novel. My favorite thing about your blog is the variety of your reading. So many books I have never heard of! I used to really dislike epistolary novels. But at one point, they started to grow on me. This one sounds really good! I know next to nothing about Newfoundland so maybe this would be a good way of dipping my toe in! I find you have to be ready to slow your reading down when reading epistolary novels – all those dates and addresses and different people the letter may be addressed to. They’re also in danger of becoming mundane with small talk about the weather, etc. This one didn’t have that problem. But maybe you’ve run into some that do! Seems like an interesting perspective on Newfoundland, which stuffs a lot into one book! By the way, guess who’s speaking at my public library this Friday? Michael Crummey and Chris Cleave. Oh my!! You so beautifully capture the essence of this novel – your initial rendering had me hooked. Wonderful review! This books sounds wonderful. You are the queen at finding hidden Canadian gems! This sounds like my kind of book! I like epistolary novels to begin with and all of the things you mentioned liking about it are things that usually appeal to me. If you like epistolary, than you couldn’t go wrong with this one. Really, the only people I can think of who might not be interested in it are people who don’t like to read about history or letters. This sounds absolutely delightful and I have enjoyed all the epistolary stories I’ve read – love the setting and the unusual love story and so to top that with the fact that it is based on real people – it has to be a winner! It must have been so rewarding for the author to find her father’s letters and to be able to tell his story! Sorry, I’ve gotten a little behind on my blog reading. My husband had an accident a month ago and I’ve been struggling with trying to keep the household running and helping him ever since. But anyway, this one sounds interesting! I hope your husband is okay, and that he is on the mend! Oh, no! Yes, I can only keep the house minimally clean, what with waiting on Wayne and caring for the animals and taking care of all the things that seem to be going wrong with the house. Luckily, he’s beginning to get around a little better. Did they put your daughter into a boot? She should be able to walk in that. Wayne is just now beginning to be able to use his foot just a little bit, after a month. She has a plaster cast, and it was just put on a week ago. So, she still has a ways to go. Maybe at some point, she’ll be able to put some weight on it. Glad to hear Wayne is on the mend! Oh, that’s too bad. Mostly lately, I’ve seen people wearing boots. What a lovely review! You make me want to rush out and buy this book right now. 🙂 It is definitely going on my TBR.